With many years of collective, collaborative experience in conference management, we have acquired a lot of insights along the way. It can be an intimidating exercise, especially when planning your first conference as there are multiple components to piece together. 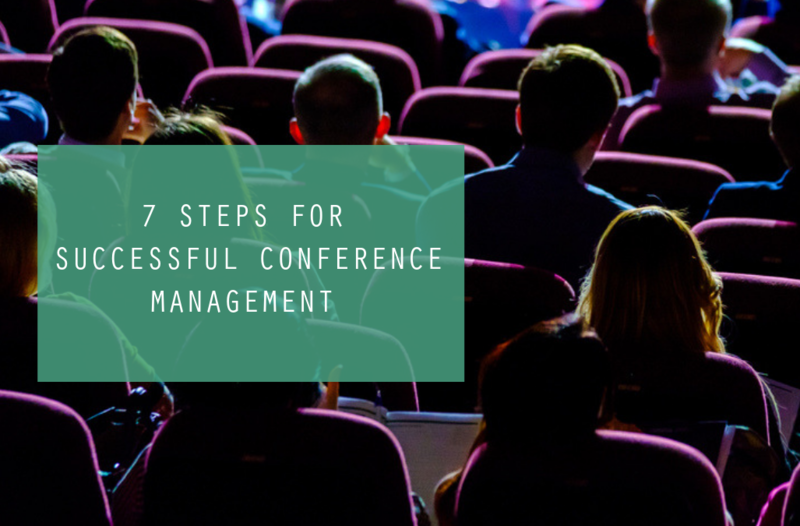 In light of this, we have put together these 7 steps for conference management paper for your guidance. Before you so much as think of a name, or what time of year you will be holding your conference, you need to down with the partners of your association or organisation and establish the end goal of the conference. Whether that may be to generate revenue, acquire new memberships, or to create awareness, this should be the fundament of all your planning. Event sponsorship can benefit your association in many ways. How will you pay for your event? Aside from exploring free resources through your network, the importance of a carefully planned exhibition and sponsorship strategy is immense. Sponsors are constantly on the lookout for new partnerships, which means meeting planners and organisers have many possibilities to establish connections that bring value to all stakeholders. It all depends on your approach. If you acquire sponsorship, then prepare a budget listing the major cost items of the bucket list you have created. Through experience, we recommend adding 10% of all costs on top of your already established budget as there is always the possibility of expenses running over. A conference planning checklist is extremely important because of the complexities and quantity of things you will need to consider. For instance, the venue you choose should be in the city you are targeting. Either that or at least very close to it. You do not want participants perceiving your event as a major expense. It is also imperative to consider how many people will attend. Your chosen venue’s size needs to cater for that. Depending on your budget, you may not get the exact speakers you want, but there is no harm in trying to connect with them. Twitter and LinkedIn are usually the platforms where industry professionals will prefer to converse with you on. It is also worth setting up a poll across your social platforms to find out what it is conference attendees look for in an event. The world is rapidly advancing and it is imperative you stay on top of current trends. Choosing who speaks at your meeting is arguably the most crucial aspect of conference management. People like to be a part of things and this is even more true for your audience. We recommend reaching out to your network to identify the speaker(s) who will best assist in achieving the conference’s objectives. Once you have compiled a list of prospective speakers, conduct research on them. Get in touch with associations who have had them speak at their events before. Once you have found your speakers, ensure they are managed properly and that they are provided with a thorough brief. Another aspect that can easily be overlooked is having a modern, easily navigable website. When it comes to marketing for associations and their conferences or meetings, having a website and online presence strategy allows you to market your association and its conferences online, to engage with a wider audience and to establish credibility as an organisation. You will need to establish a direct and simple online user journey for prospective attendee when they are wanting to purchase tickets to your conference. All roads need to lead to your website, so make sure it is excellent. There really is no point going through all the trouble of organising an event if you do not market it online. In the digital age, this is the primary way of creating awareness around your meeting. Without a comprehensive digital marketing strategy, you will limit attendance. You can increase your reach and reception online through creating engaging content and ensure you support this with a clear call to action. Follow these steps to host a successful, well-orchestrated conference. You may need some assistance to guarantee it runs seamlessly. If you do, we are here to help. As experts in conference management and a member of the International Association of Professional Congress Organisers, we hold the know-how and human capital needed to design, plan, manage, and coordinate every facet of your conference from start to finish, ensuring that nothing is left to chance. Contact us.